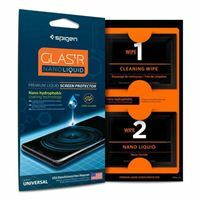 Bringing the latest generation of glass protection to stay compatible with the new generation of Samsung smartphones. The sides of the Glas.tR Curved HD are engineered to provide extended coverage for the infinity screen without zero lifting. The secret to its long staying power is an optimized cutout that houses more of its strong adhesive. The slim but powerful glass with 9H ensures the feel and look of the original glass along with seamless compatibility with all Spigen cases. Let the glass protector take the hit, not your phone.